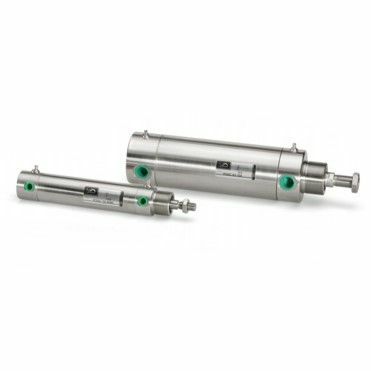 Round magnetic stainless steel pneumatic cylinders. Round Stainless Steel Cylinders for food, chemical, beverage and processing environments. The RSSC series is designed for applications in aggressive environments where washing, cleaning and maintenance are continuously needed. Sleek surfaces and radiates angles are manufactured with high accuracy in order to grant very easy cleaning operations and to avoid dirt retention. Parts are designed and assembled in order to allow easy and efficient maintenance by reliable and fast disassembling. BORE Select 32mm. 40mm. 50mm. 63mm.